Isuzu Australia Limited has announced Hiroshi Nishizaka as its new CEO and managing director after former chief Koichi ‘Mike’ Yoda moved back to Japan. Beginning the role in June, IAL says Nishizaka comes with an extensive background with Isuzu in Japan and a number of senior positions around the globe – most recently a four-year term as CEO position at Isuzu Truck South Africa. After completing his Mechanical Engineering degree at Keio University, Nishizaka began his career in the company’s local engineering division in 1980. On the back of four years at Isuzu Motors Limited Japan, he began his overseas journey by heading off to Isuzu Motors America LLC. Arriving at IAL’s Port Melbourne office 32 years later, Nishizaka says he is "keen to contribute to the continued global success of the brand throughout the region." 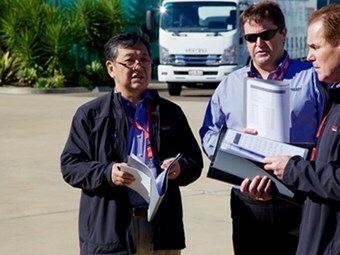 "Australia is held in extremely high regard by Isuzu Motors Japan," he says, and to maintain that position he will be focusing upon "the importance of customer care and the key contribution this makes to our brand and reputation." "I am excited to continue to work on these key focus points and build on the strong history of business success here in Australia," he says. "I will strive to ensure the highest level of effectiveness in sales and operations achieved and maintained." Highlighting that Koichi Yoda "achieved a great deal" during his four years in the role, Nishizaka says he’s "extremely honoured to be picking-up where he left off" and is looking "forward to a prosperous future here in Melbourne."